The world’s first Census of Marine Life was released today, a 10 year, 650 million dollar study of the ocean. In Citizens of the Sea, Nancy Knowlton discusses the shell-crushing force of the Mantis Shrimp and the ribbon worm. Humans, being the top predator of the planet, now have little to fear from man-eaters in the ocean, the movie Jaws notwithstanding. But most marine animals are eaten (usually sooner rather than later) by an array of predators, some of whose tools of the trade make the razor-sharp teeth of the fangtooth seem positively boring. Claws with hammers are the weapon of choice for mantis shrimps that eat hard-shelled prey, such as snails. The blow is delivered with extraordinary speed. The hammer can move more than 50 miles an hour, and the strike happens so quickly (it takes less than three-thousandth of a second) that even filming at 5,000 frames per second misses some of the action. They are, indeed, the fastest gun in the west-with a speed comparable to a .22-caliber bullet, no animal arm or leg is faster. 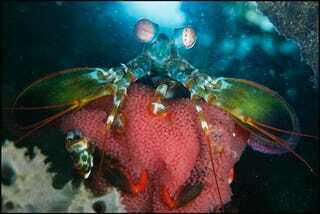 To accomplish this feat, the mantis shrimp stores energy in elastic springs, much as a crossbow stores the energy of an archer, and like a crossbow, the strike is precisely timed by releasing a latch. The force initially delivered is thousands of times greater than the weight of the animal, and indeed is considerably greater than the force of gravity on an adult human body. Even water-vapor bubbles are formed, which amplify the damage. It is thus no surprise that big mantis shrimp can break through the glass wall of an aquarium. On the slower but weirder side of the spectrum are the ribbon worms that prey on fiddler crabs as they walk about the sand to feed and mate. Unlike the sandworms of the sci-fi classic Dune, ribbon worms rely not on speed but on stealth. Lurking below the surface, the worm emerges when a crab passes overhead, turning its proboscis inside out and covering the crab with toxic slime. Once the victim is paralyzed, the worm finds a crack in the body by which to enter and crawls inside, digesting the crab from the inside within an hour. And these ribbon worms are small fry-some of their cousins reach 100 feet in length, which is as long as a blue whale. Dr. Nancy Knowlton received her PhD from the University of California at Berkeley, founded the Center for Marine Biodiversity and Conservation, and holds the John Dove Isaacs Chair in Natural Philosophy at the Scripps Institution of Oceanography of the University of California at San Diego. Her research focuses on the ecology and evolution of coral reef organisms. Reprinted with permission of the National Geographic Society from the book Citizens of the Sea: Wondrous Creatures from the Census of Marine Life by Nancy Knowlton. Copyright © 2010 National Geographic Society. Text copyright © 2010 Smithsonian Institution.